Can I make a confession? As much as I love the farmer’s market I’d say 75% of the time I buy fresh veggies they end up going bad. While my 3 boys can put down the fruit in no time flat I’m horrible about making last minute changes to my planned meals or opting for take out and those nice fresh veggies I bought with good intentions get shoved to the back of my produce drawer and wasted. So over the years I’ve developed a secret weapon to my cooking-frozen foods! Among the many benefits of frozen foods, buying frozen helps me to cut the waste and makes my meals fast and easy. Today I want to share a super easy summer menu with you to show you what I mean-Fajita burgers and sweet potato fries with cilantro jalapeño dip and for dessert, a yummy grilled poundcake topped with ice cream and berries! Remove pound cake from freezer and place on counter to thaw according to package instructions. Preheat oven and start fries according to package instructions. In a food processor combine yogurt, jalapeño, and cilantro and pulse until smooth. Refrigerate until ready to serve. Grill burgers as directed on package. While burgers are cooking heat frozen pepper and onion blend in medium saucepan until heated through. Place burgers on buns and top with pepper jack cheese, peppers and onions, and cilntro jalapeño dip. Serve with fries and more dip. When you’re ready for dessert simply preheat a grill or griddle on medium high heat and grill 1″ slices for 1-2 minutes on each side. 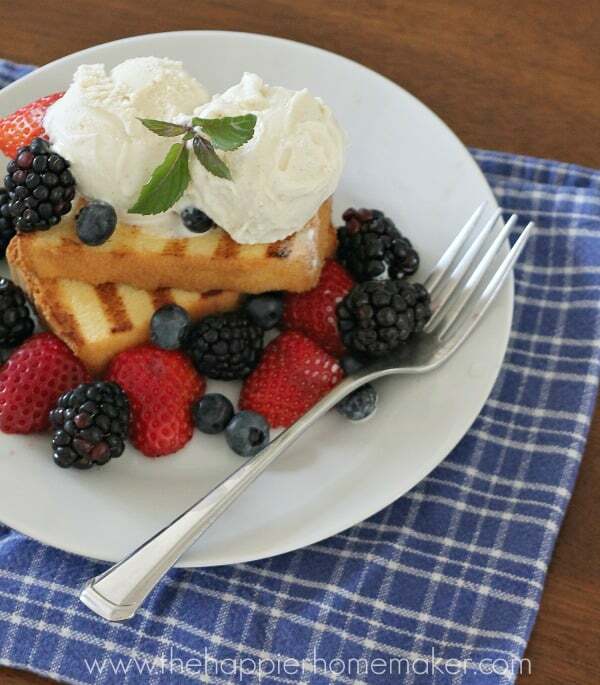 Serve warm topped with ice cream and berries. Do you use frozen foods to make life in your kitchen easier too? My family is obsessed with those sweet potato fries! We really love the spicy ones.